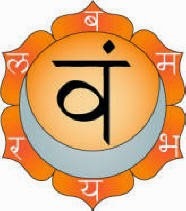 Day 2 of my study is focused on the sacral chakra, Svadhishthana. It is located just above the root chakra between the tailbone and sacrum. This is where our subconscious, the level between sleeping and waking, exists and manifests. Orange is the color associated with the Svadhishthana chakra and it relates to fire in terms of purification, self-confidence, willpower, activity, and happiness. Turning your senses inward to develop a deep understanding of this chakra will result in a higher self-awareness and even insight on an individual’s destiny. Our subconscious picks up on all things, sometimes things we hardly even notice, and those events in turn translate as a film over our consciousness. This subconscious film of perceptions influence our actions and decisions in everyday life. If we can learn to fully examine our inner being and intentions then we can harness those thoughts and emotions of our past to manifest our destiny. Greed, jealousy, anger, cruelty, laziness, hatred are all obstacles we face within the Svadhishthana chakra and the key to releasing these barriers is to understand their origin rather than attempt to fight or ignore them. In examining this chakra through meditation I repeated the mantra “Vam” a total of four rounds. A half moon is symbolic in this chakra as representation of the female cycle and fluidity. It is also important to maintain a water-like fluid method of thinking when approaching this chakra. Therefore I meditated on the color orange moving as water through this area of my body. I practiced multiple poses that are significant in understanding and quieting the obstacles associated with the Svadhishthana chakra. I have listed these poses (or sequences) below and it is important when practicing to keep your attention locked in the sacrum for release of unwanted thoughts and emotions trapped within.